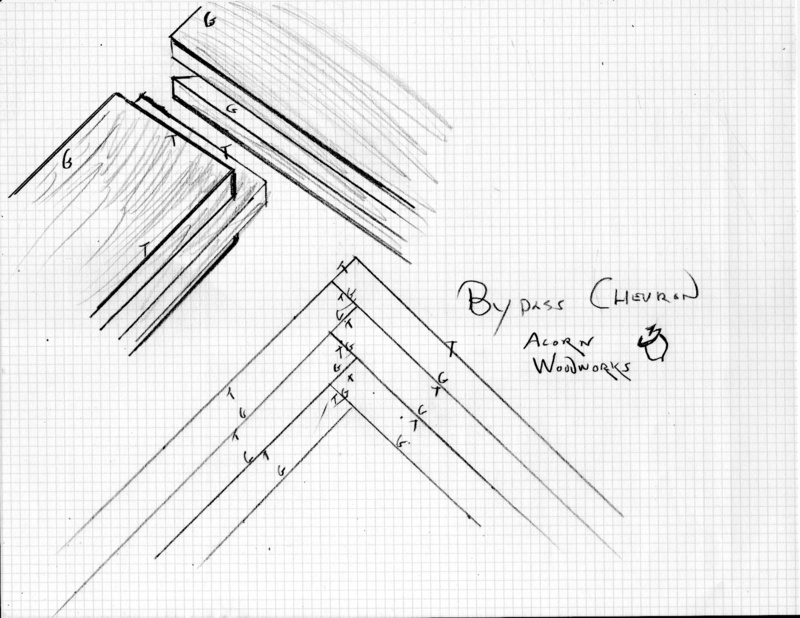 Could I expect a chevron pattern of mixed hardwood boards glued edge to edge , & end to edge, 3/4” to stay together within a grooved frame 30” x 100” , for a barn style door as said in previous post ? My guess is that it will not stay together. But I don't know if there is room for the panel to float, what the species is, what state it will be installed in, and how conditioned the space is around them. In my region, with furnaces blazing, the wood is as narrow as it gets right now. Come July and August, it will get much wider unless if it's quarter sawn . Chevron or herringbone with the T&G and be done with a loose spline. We did not feel like the regular T&G we milled along the edges had the strength to hold up in end grain, so we make a 1" deep plow in the ends of the boards, butter it up, and glue a spline into the voids, pulling the two ends close while the glue sets. Instead of butting the two ends together, a 'bypass chevron' can be made. This can go together without extra joinery, as long as the ends are tongued or grooved. As and all the 'left; side parts are tongue and all the 'right' side parts are grooved on the ends. All the above assumes the maker has the skill to make a basic door, and all the panel boards are not just going to be PL 400'd and pinned to a sheet of 1/2" ply.